On behalf of all the participants I would like to welcome you to the annual Festival of Church Music at Edington. Whether a regular or a first-time visitor I hope that you will find the services during the week spiritually uplifting. 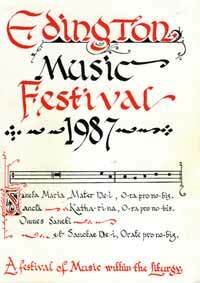 I first attended the Festival in 1984 and was immediately impressed by the way in which the music complemented the liturgy. This is the Festival’s greatest strength and one of the reasons for its unique character. Too often the r61e of music within the liturgy is questioned, but here at Edington the argument is irrelevant, partly due to the spirit of unity which the Festival engenders between the clergy, musicians and congregation. This is my first year as Director of the Festival, but regular visitors will find that I have not made too many changes. The theme which will be explored this week is based on the imagery of ‘The Song of Songs’ and St John of the Cross’s ‘Spiritual Canticle of the Soul’. The services on Wednesday reflect the central idea of these works – Christ’s delight in the Church and the world, whilst the other days deal with human reaction to the divine gift, represented by the Nativity. Thus the services on Tuesday portray Mary as the paradigm in her response to God’s choice and calling. Thursday’s services attempt to express the Church’s or the individual’s adoration of Christ, whereas services on Friday are concerned with the Church’s relationship with the world. Saturday is more reflective in its expression of longing; we can never hope to attain the heavenly state here on Earth because we are separated from the Divine Essence as a result of man’s sin, expressed here through the Crucifixion. Sunday however looks forward to that time when we shall be in full communion with Christ. The text of The Song of Songs has inspired many composers and was especially important in the sixteenth century. Palestrina, for example, wrote a complete set of motets on words from this book, and many of St John of the Cross’s contemporaries in Spain were equally inspired; Francisco Guerrero’s motet ‘Surge propera amica mea’ is particularly interesting in this respect for it combines the text from ‘The Song of Songs’ with the chant, ‘Veni sponsa Christi’, thus alluding to the Church as the bride of Christ. This year’s commissioned piece by Francis Grier also sets passages from ‘The Song of Songs’ to express the idea of adoration. Francis was educated at Eton and King’s College, Cambridge, and was until recently Organist of Christ Church, Oxford. The choice of music elsewhere is biased towards the sixteenth century, but I have attempted to achieve a well-balanced programme including twentieth-century works. Last year we said goodbye to Geoffrey and Tessa Webber, and I would like to thank them for all they have done for the Festival over many years. This year will be Maurice and Eileen Bird’s last Festival; it is difficult to imagine Edington without them, for they have given such sterling support to the Festival. I am sure that you would like to join me in wishing them great happiness in their retirement. My thanks also go to Tim Kermode, John Barnard, Hilary Dodds, Sister Agnes Irene, Revd. Dr Alvyn Pettersen, Chaplain of Exeter College, Oxford, and to many others who have assisted in the preparation for this year’s Festival.